We hope you all have successfully applied for the TNPSC Group 2a Non Interview Post exam 2017' well before the last date for applying Group 2 Exam as per the notification. Lakhs of candidates have applied for TNPSC Group 2 Non Interview posts Exam 2017. TNPSC Group 2 Non Interview posts 2017 Exam Date as published in the notification is August 8, 2017. When you can Download your TNPSC Group 2 Non Interview posts Exam 2017 Hall Ticket? One or Two weeks before the TNPSC Group 2 Exam, the hall ticket of each candidates will be uploaded in the official site of TNPSC. This time we can expect the TNPSC Group 2 Hall ticket will be published between the Last week of July 2017 to First week of August 2017. Check here the TNPSC Group 2 2017 Exam all Vacancy details postwise and the districtwise. How to Download TNPSC Group 2 Non Interview Posts 2017-2018 Hall Ticket? Latest: TNPSC Group 2 Interview Posts 2015 Hall Ticket Download Here http://tnpscexams.net/callletter/tnpsc_072015/index.php Application Status Check http://www.tnpsc.gov.in/Appstatusget-csse12k15.html. How to Download TNPSC Group 2 Interview Posts 2015 Hall Ticket? All the successful candidates shortlisted from the TNPSC Group 2 Preliminary Exam Result which was conducted on Dec 1st 2013 can appear for the upcoming TNPSC Group 2 Mains Examination. Candidates can download TNPSC Group 2 Interview Post Mains Hall Ticket two weeks before the written exam. The Date of TNPSC Group 2 Mains exam 2014 is 8th November 2014. You can download the TNPSC Group 2 Mains Hall ticket now in the below Link. Latest: TNPSC Group 2 Mains Hall ticket uploaded Download soon. Dear Candidates Help us to find the TNPSC Group 2 Interview Post prelims cut off marks. Just Vote the TNPSC Group 2 Cut off Mark Poll here . 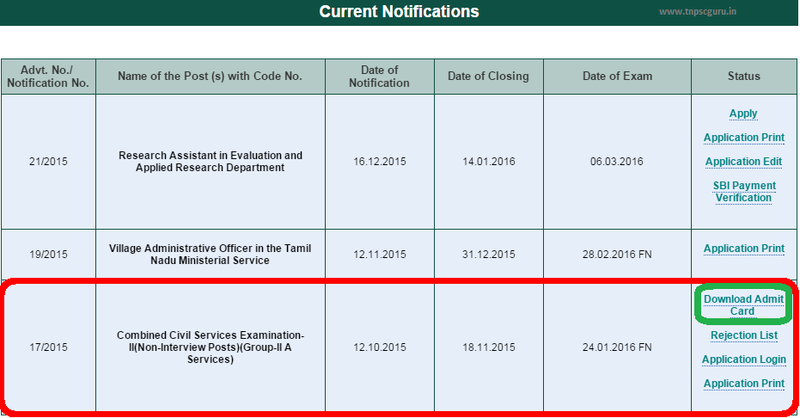 How to download TNPSC Group2 non interview post hall ticket? I ASKED TNPSC ABOUT GROUP II MAINS HALL TICKET. Any update ? why Hall tickets are not yet released? Any information? hall tickets (Group II main) are not released in tnpsc. please tell me sir? I don't know why it is getting delayed.. just 4 days left for the exam..
Let us hope.. at least by today the hall ticket will be uploaded.. ACCOUNTANT or ASSISTANT, which comes first in hierarchy ? Hall tickets will be posted on November 5 - made a call to TNPSC and got this info. Will the examination centre be exclusively in Chennai (like Group 1) or can we expect it in Trichy, Madurai etc? many centers are there for group 2 mains.. check group 2 notification..
is any chance to postponed group 2 mains? Now you can download your HALL TICKET... All the best guys..
no need to worry... you have already sent the dd to tnpsc right??? those who have not sent their dd yet, kindly submit it in the exam hall..
Also one clarification needed i could not find any info regarding the DD in the hall ticket instruction can you please tell us in which point it is mentioned???? Sir.. i have a doubt regarding essay part... wat is the maximum number of pages to cover in the essay writing??? Hai sir would like to know abt Deo main exam... Model question paper..
and i sent my deatails to the contacttnpsc@gmail.com.... After i saw a news in Dinamalar. I paid fee.. All details r right. Bt i cnt get hall ticket. My num 517243135. So no one will help ah. Thn y they gave add in paper.... Its our life.... .